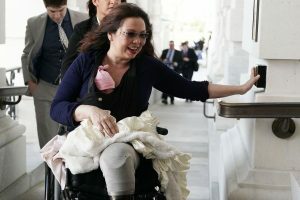 Last week, Senator Tammy Duckworth (D-IL) made history as she became the first United States senator to cast a vote on the Senate floor with a newborn in her arms. Senator Duckworth is also the first United States senator to give birth while in office. In and of themselves, both achievements are important steps in achieving equality for women. What has been less recognized, however, is their importance to parents and prospective parents with disabilities. 48 percent of mothers with disabilities encounter problems managing work and family demands, compared with 29 percent of mothers without disabilities. Of course, Senator Duckworth’s experiences are not unique or uncommon. Working mothers with disabilities face a number of challenges related to both their disability and role as mothers. According to a survey conducted by Working Mother, 48 percent of mothers with disabilities encounter problems managing work and family demands, compared with 29 percent of mothers without disabilities. Mothers with disabilities often face discrimination in the workplace and are denied reasonable accommodations. Surely, this bias is because of their gender, disability, and parental role. For mothers with disabilities who are also members of other marginalized communities, the challenges are even greater. Like Senator Duckworth, I have a physical disability and am a wheelchair user. I have arthrogryposis, and have limited use of my arms and legs. I use personal care assistants (PCAs) to help with most activities of daily living. Undoubtedly, I will need significant assistance completing many parenting responsibilities. Will working make it even more difficult for me to care for a newborn? Absolutely. Yet, with the right supports and policies, I strongly believe that parents with disabilities and their families can be successful. Likewise, I believe greater supports should be available to address the needs of all parents—regardless of if they have a disability. The African proverb, “It takes a village to raise a child,” recognizes that all parents, whether or not they have disabilities, cannot and should not parent alone. Last week, Senator Duckworth’s village included senators from both sides of the political spectrum who realized the necessity of supporting working mothers. Yet, this realization needs to transcend into mainstream America. We must support all working mothers, and this must happen now! Working as a mother is difficult. Adding a disability into the mix can make it seem insurmountable. However, thanks to Senator Duckworth, and the countless disabled mothers who came before me, I know that it is possible!